The academic year in the village school of Ditci in the Gori region started on a happy note this Autumn. The Government of the Republic of Hungary has donated a bus in support of this community, which is on the edge of the conflict zone near the administrative border with South Ossetia. The Russian aggression devastated the village and the school was looted after Russian troops left the building, which they had used as their military headquarters. The Hungarian Government presented laptop computers to the school in October 2008 to replace ones which had been stolen. The bus was presented to the headmaster of the school by H.E. 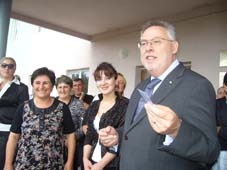 Mr. Gabor Sagi, the Hungarian Ambassador to Tbilisi on14 September 2009.